Three UNH faculty members have received prestigious National Science Foundation awards to support their work predicting earthquakes, recycling carbon dioxide into fuel and measuring methane bubbles. Margaret Boettcher, assistant professor of geophysics, Gonghu Li, assistant professor of chemistry and Tom Weber, assistant professor of mechanical engineering, received the NSF’s Faculty Early Career Development (CAREER) awards. The grants support junior faculty who “exemplify the role of teacher-scholar through outstanding research, excellent education, and the integration of education and research within the context of the mission of their organizations,” according to the NSF. 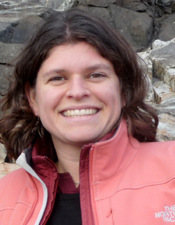 Boettcher studies earthquake processes and prediction by monitoring frequently active oceanic transform faults. She currently is focused on the underwater seismic activities at two faults on the East Pacific Rise in the Pacific Ocean. Collecting data from these faults will help Boettcher understand the geophysical conditions that govern when and where earthquakes will take place. “Because earthquakes at these sites cause no harm to society, we can actually root for a large earthquake to occur there,” Boettcher said. To introduce geophysics and earth science concepts in physics classrooms, Boettcher will organize high school teacher workshops to inform teachers about contemporary earthquake research and to train them to communicate the research to their students in ways that are consistent with Next Generation Science Standards. Each participating teacher will be paired with a graduate or undergraduate student mentor from UNH who will provide one-on-one support. “This CAREER award will help me to integrate my teaching and research projects at a new level,” Boettcher said. In addition, two female Ph.D. students will be financially supported and trained during the award period. Li uses chemistry to explore innovative catalytic systems to recycle carbon dioxide into fuels using sunlight as a sustainable energy input. In nature, trees and other plants convert carbon dioxide and water into carbohydrate molecules such as sugars in a process called photosynthesis. The activation of carbon dioxide often requires high energy, but nature does so via low-energy pathways. “We want to learn from nature and develop catalysts that can operate at low energy costs,” Li said. His research group is currently using both experimental and theoretical methods to investigate low-energy pathways for the activation of carbon dioxide on transition metals. Li’s CAREER award builds upon his previous research incorporating surface chemistry, molecular catalysis, photocatalysis and nanoscience. This award will also let Li expand the solar energy workshops designed for K-12 science teachers he has previously hosted. Further, his research group will welcome students from historically African American institutions and female undergraduate researchers to his lab each summer, thus helping increase the diversity of the emerging STEM workforce. Weber’s CAREER work will draw on his interdisciplinary research in UNH’s Center for Coastal and Ocean Mapping and the mechanical engineering department. Weber uses underwater acoustics to measure methane bubbles that rise from certain areas of both salt and freshwater bodies. He and his students will use his CAREER funding to construct a novel acoustic instrument to measure the size and quantity of deep-sea bubbles as they float upward, helping to understand their eventual fate. “We’re interested in whether or not these bubbles make it to the surface, and how much methane is released directly into the atmosphere,” Weber said, noting that methane is a potent greenhouse gas. Weber will also use his CAREER award to help develop echo sounding kits for middle school students, and in collaboration with New Hampshire Sea Grant, he will supervise UNH undergraduate and graduate students to provide middle school students with a hands-on introduction to marine science and ocean engineering. Since the NSF CAREER program began in 1995, 23 UNH faculty have received these awards. Eligible faculty interested in applying to the NSF CAREER program can contact the UNH Office of Research Development & Communications for information and assistance.